One of the cool things about Mattel's DC Universe line is the way each series tries to pair a particular hero with an arch-enemy. Series 1 has Batman and Penguin; Series 2 gave us Aquaman and Black Manta; and obviously Series 3 has chosen to pair Green Lantern with Sinestro. Sinestro is a perfect demonstartion of the problem with the DC style of giving characters a weakness: when you make your hero's vulnerability some outside force - in this case, the color yellow - eventually a villain will come along who utilizes that as his primary attack. Of course, the hero has to prevail, as a function of the story, so his "weakness" turns out to be nothing but a minor inconvenience, and you end up with a character who's dull as dirt because they'll never have any real shortcomings. 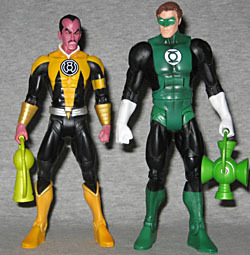 And, hey, speaking of "shortcomings," here's Mattel's new DCU3 Sinestro! He gets a new body, but unfortunately, it's ridiculously tiny. He's not as small as the teens, like Robin, but he's not even close to Nightwing size (the next largest body). He does just come over the 6" mark, but Mattel tends to make their figures a little too large, so Sinestro looks like a real shrimp. Now, obviously this had to be approved by DC corporate, but "approved" doesn't mean "correct." He's not supposed to be comically small next to Hal "Lingering Hug" Jordan, and this figure is. That's beyond disappointing; it's just plain wrong, and Mattel should have done better. Sinestro is, along with Deathstroke, one of the variant figures in this series. One version of the alien shows him in his classic blue costume, while the other has his new yellow Sinestro Corps uniform. They also have different belts. Woo! Belts! Hey, at least Mattel was paying enough attention to get that right - it would have been easy for anyone to overlook. The two variations are supposedly available in equal numbers, but good luck finding the yellow version. Hell, good luck finding either version: the distribution on Series 3 is, so far, the worst of any DCU series. And yes, that includes the notoriously under-ordered Series 5. On top of that, though, the yellow Sinestro seems to be plagued by almost chronic paint problems. It seems the Sinestro Corps insignia on the chest and arm were just too tough to paint properly. Poe, for instance, got one with a giant thumbprint on the chest, and on mine, the armband is heavily smeared. Reports of similar problems have come in from all over, so you ned to be very careful - and that's to say nothing of the poor coverage of yellow paint over black plastic. One area of the figure that's above reproach, however, is the head. The Four Horsemen have captured Sinestro's personality well, giving him a haughty look and a bit of a scowl, as well as that unmistakable bulbous forehead. Matching his appearance in the recent comics, his eyes are black with yellow pupils. It's really an unsettling combination, and helps him look more alien. His magenta skin gets a darker wash to bring out the details, and his hair is just as black as his outfit. Sinestro's articulation is exactly what we always get from DC Universe: balljointed head, balljointed shoulders, swivel biceps, single hinged elbows, swivel wrists, hinged torso, swivel waist, balljointed hips, single hinged knees and hinged ankles. Surprisingly, I didn't have any particular problems with the joints on this figure: some of them stick a bit even now, but none broke or sheared off. That's one in the win column! Obviously double knees and elbows would be preferable, but if the Horsemen can't pull it off, we'll have to be happy with the inferior joints. Sinestro's power ring emanates a beam of yellow energy that can allow unaided interstellar travel, create offensive and defensive force fields of anything Sinestro can imagine. It is a powerful and deadly weapon in direct opposition to Green Lantern's power ring. Both versions of Sinestro come with a neon yellow power battery, so they can recharge their rings when they run dry. While that's fine for the Sinestro Corps version, as they actually do use batteries, it's incorrect for the blue one. Why? Because before starting his own organization, Sinestro never had a battery. His ring was designed to be recharged by the energy of a GL ring, which was the perfect source - he was always around GLs, so they were always juicing him. 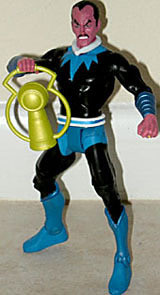 Part of DC Universe Series 3, Sinestro comes with a part of the Build-A-Figure, Solomon Grundy. Yes, technically it's a "Collect & Connect" figure, but that's a stupid name and only serves to underscore how Mattel is playing catch-up with ToyBiz/Hasbro. Matching his arch-enemy, Sinestro gets one of Grundy's legs; in this case, the right. Giant size, torn pants, good paint... everything is more or less the same. But other than Metamorpho, whose legs should be different? [Ultra, the Multi-Alien --ed.] That's right, nobody. It's very cool that Mattel wasted no time in jumping on the Sinestro Corps bandwagon, because the story really is one of the best things to come out of DC since the wonderful Identity Crisis. But this particular figure just has too many factors working against it to be worth your money: it's far too short, and the paint apps are incredibly bad. If you want the BAF piece, then sure, he's perfectly acceptable - but if you just want a Sinestro Corps version of the man himself, don't bother with the DCU3 version, and instead get the DC Direct version. Its articulation isn't as good, but at least it's an appropriate size and you won't go mad trying to find one that's been painted at a professional level. Plus, hey, free bonus Despotellis! At any rate, Sinestro is a rare letdown from Mattel and the Four Horsemen. Well, from the Four Horsemen, anyway: we're used to Mattel letting us down.